Spectra: E. Kuulkers (ESA/ESAC) et al. report that Nova Sco 2014 was detected by the Swift satellite in X-rays on about March 27.17 UT (ATel #6015); the X-ray spectrum is consistent with an expanding shell in a nova. A spectrum obtained on Mar. 27.8 UT by K. Ayani and S. Maeno (Bisei Astronomical Observatory, Ibara Okayama, Japan) indicates that this object is a nova in early phase. Their spectrum is posted at http://www.bao.city.ibara.okayama.jp/astro/2014/nova/TCP_J17154683-3128303_Mar27.png. Optical and near-infrared spectra from several sources indicate a symbiotic nova (ATel #6025, #6032, #6034). Subsequent observations by Swift (K. Page et al., ATel #6035) obtained March 27-April indicate "a shock emerging from a secondary star wind, as expected in a symbiotic nova." See CBET 3841 and ATels for details. Observing recommendations: Observations of all types (visual, CCD, DSLR, spectroscopy) are strongly encouraged in following the evolution of this nova. Filtered observations are preferred if possible. Charts: Nova Sco 2014 has been added to the International Variable Star Index (VSX, http://www.aavso.org/vsx). Finder charts with a comparison star sequence may be created using the AAVSO Variable Star Plotter (VSP, http://www.aavso.org/vsp). Submit observations: Please submit observations to the AAVSO International Database using the name NOVA SCO 2014. Once a GCVS name has been assigned, please use that name. a. Announced on AAVSO Special Notice #383 (E. Waagen) and IAU CBAT Central Bureau Electronic Telegram 3841 (Daniel W. E. Green, ed.). b. The object was designated TCP J17154683-3128303 when it was posted on the Central Bureau's TOCP webpage (http://www.cbat.eps.harvard.edu/unconf/tocp.html). 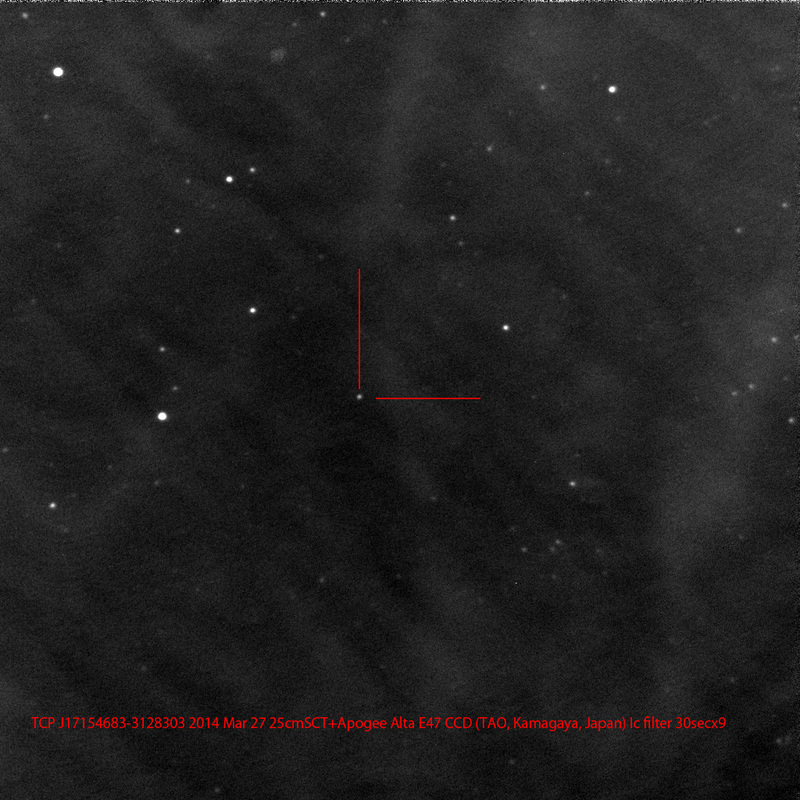 c. Nishiyama and Kabashima confirmed the discovery on unfiltered CCD frames taken around 2014 Mar 26.8698 UT. Survey frames from 2014 Mar 22.819 UT (limiting mag.= 12.5) and 23.836 UT (limiting mag.= 12.9) show no object, nor does DSS or USNO-B1.0. - T. Noguchi (Katori, Chiba-ken, Japan), 2014 Mar. 27.729 UT, 46.88s, 30.4"
- T. Yusa (Osaki, Japan), Mar. 30.70717, 46.87s, 30.4"
- Nishiyama and Kabashima report the nearest star in the DENIS Database has position end figures 46.861s, 30.48", distance 0.44", magnitude I=14.222. - T. Noguchi (Katori, Chiba-ken, Japan) identified a star (mag.= 15.8, position end figures 46.87s, 30.3") on DSS (POSS2/UKSTU Red:1992.07.21). - T. Kojima (Gunma-ken, Japan) identifies 2MASS17154687-3128303 (Jmag 11.255, Kmag 9.578) is located at nova coordinates. Congratulations to Koichi Nishiyama and Fujio Kabashima on their latest discovery! 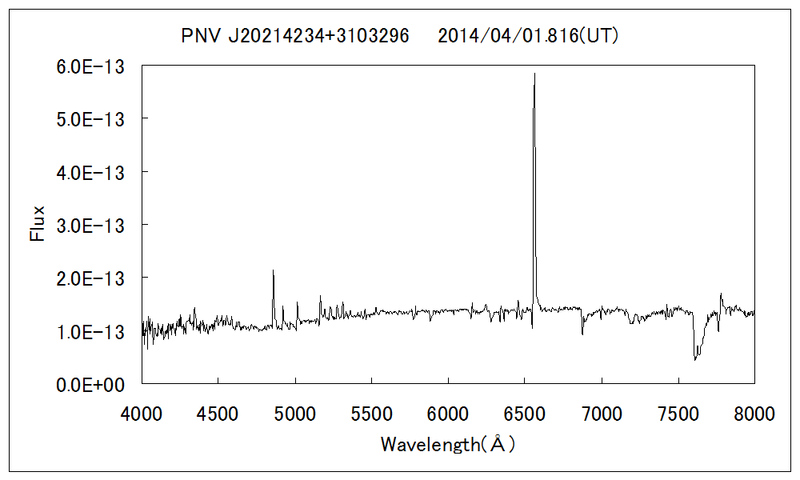 Spectra: Spectra obtained on 2014 Apr. 1 by U. Munari et al. (Istituto Nazionale di Astrofisica, Padova Astron. Obs., Italy), by A. Arai et al. (Nishi-Harima Astron. Obs., University of Hyogo, Japan), by K. Ayani (Bisei Astron. Obs., Ibara, Okayama, Japan), and by M. Fujii (Fujii Kurosaki Obs., Kurashiki, Okayama, Japan) all indicate a highly reddened classical Fe II-type nova around maximum. See CBET 3842 for spectra details; spectra URLs in Note f.
Observing recommendations: Observations of all types (visual, CCD, DSLR, spectroscopy) are strongly encouraged in following the evolution of this nova. Filtered observations are preferred if possible due to the reddened nature of this object. Charts: Nova Cyg 2014 has been added to the International Variable Star Index (VSX, http://www.aavso.org/vsx). Finder charts with a comparison star sequence may be created using the AAVSO Variable Star Plotter (VSP, http://www.aavso.org/vsp). Submit observations: Please submit observations to the AAVSO International Database using the name NOVA CYG 2014. Once a GCVS name has been assigned, please use that name. a. Announced on IAU CBAT Central Bureau Electronic Telegram 3842 (Daniel W. E. Green, ed.). b. The object was designated PNV J20214234+3103296 when it was posted on the Central Bureau's TOCP webpage (http://www.cbat.eps.harvard.edu/unconf/tocp.html). c. Nishiyama and Kabashima confirmed the discovery on unfiltered CCD frames taken around 2014 Mar. 31.820 UT. Survey frames from 2014 Mar. 27.781 (limiting mag.= 13.4) show nothing, nor does DSS. - Nishiyama and Kabashima, 2014 Mar. 31.790 UT, 42.34s, 29.6"
e. B. Skiff (Lowell Observatory, Flagstaff, AZ) reports (vsnet-alert 17124) SDSS image coverage in this area from epoch 2005.4355. Within 0.3" of the published position is a faint (mag ~22?) star of neutral color that is the northwestern star of a ~1" pair and is a possible progenitor. Congratulations to Koichi Nishiyama and Fujio Kabashima on their second discovery within a week!